I remember my fist impressions of Saidian after hearing their 2006 release Phoenix: if Edguy has a clone, certainly a doppelganger, then it is most likely fellow Germans Saidian. Well, with their latest Evercircle, I'm afraid the comparisons will continue (but that doesn't have to be a bad thing). Yes, vocalist Markus Engelfried has an uncanny resemblance to Tobi, and their song arrangements sound suspiciously like Edguy circa Vain Glory Opera or Theatre Of Salvation. But that's cool with me: that's my favorite Edguy period; more melodic heavy metal often deliver over a power metal foundation. To this end, Saidian is quite accomplished and entertaining. The real challenge is not to be boring in doing so. To start, you may think that is what's happening on Evercircle for it leads off with your typical quick power metal song. This is followed by three generic melodic metal numbers which feature founding member and songwriter Markus Boher's proficient but often overbearing keyboard presence; the too long Once In My Dreams is particularly tiresome as it does not know whether to be a metal ballad (at the start) or a metal anthem (at the end). If you can suffer through this, then you will get to the meat of Evercircle and its best stuff. From Pale Moon Rider to the end, Saidian delivers impressive and entertaining melodic heavy metal, and most importantly, Boher's keyboards are better balanced with the other musicians. This latter half has several excellent songs. Moonlight's Calling and Sign In The Sky are delights because their arrangements feature more diversity and better movement nearing progressive metal. The Princess, sound almost like a clone of Edguy's Vain Glory Opera at the start, has a massive melody and a brilliant vocal arrangement. This pattern continue with closing number Halos For Everyone, a philosophically ambiguous number about mankind's self salvation. Saidian's Evercircle is certainly as good as their previous outing Phoenix, maybe even stronger in the latter half. Saidian delivers entertaining, and sometimes quite ambitious, melodic heavy metal: nothing really novel or new, just very good. Very recommended. 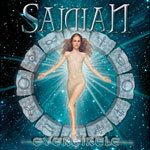 Saidian's Evercircle is certainly as good as their previous outing Phoenix, maybe even stronger in the latter half. Saidian delivers entertaining, and sometimes quite ambitious, melodic heavy metal: nothing really novel or new, just very good.